Intrauterine growth restriction (IUGR) is a condition where the fetus does not attain its biologically determined growth potential due to a pathological process. The main tools for antenatal surveillance in a growth-restricted fetus include amniotic fluid volume, Doppler studies, and biophysical profile. The frequency of surveillance depends on the severity of the growth restriction and the findings on previous ultrasound studies. The decision to deliver the fetus is dependent on factors such as gestational age, severity of growth restriction, and findings on the Doppler studies. If there is severe abnormality in the Doppler studies, lower segment cesarean section is recommended as the mode of delivery. Vaginal delivery may be attempted after induction of labor if Doppler parameters are normal, in a center with adequate facilities for monitoring facilities and when there are personnel with expertise. This review provides an overview of antenatal monitoring in a pregnancy with IUGR and decision-making during the time of delivery. Intrauterine growth restriction (IUGR) is a condition where the fetus does not attain its biologically determined growth potential due to a pathological process and is associated with significant morbidity and mortality. The etiology includes maternal and fetal factors as well as placental or cord abnormalities that lead to a restriction of growth of the fetus in utero. Optimal antenatal monitoring with ultrasonographic studies and charting of the growth of the fetus can guide the treating physician toward taking corrective measures and deciding on the time and mode of delivery. The involvement of the mother is an integral part of surveillance, and simple techniques such as a fetal kick count can help in decision-making. This review provides an overview of antenatal monitoring in a pregnancy with IUGR and decision-making during the time of delivery. A quantitative estimate of amniotic fluid volume is an indicator of fetal well-being and decrease in amniotic fluid associated with chronic fetal compromise. It is also a part of the biophysical profile. Amniotic fluid volume is assessed by calculating the four-quadrant amniotic fluid index (AFI) or by measuring single largest pocket of amniotic fluid. The abdomen is divided into four quadrants using, umbilicus as the reference. AFI is calculated by adding the depths of amniotic fluid (in cms) in all four quadrants. Each quadrant should be free of cord loops at the time of measurement. Normal AFI is 5–25 cm (<5 cm is considered oligohydramnios). RCOG and ACOG recommend the use of a single deepest vertical pocket (DVP) to interpret amniotic fluid volume. DVP refers to the vertical dimension of the deepest pocket of amniotic fluid (with a horizontal measure of at least 1 cm) not containing umbilical cord or fetal extremities and measured at a right angle to the uterine contour and perpendicular to the floor. Normal DVP is 2–8 cm. The pulsatility index (PI) is the Doppler parameter which denotes degree of resistance to blood flow through the vessel. Umbilical artery (UA) Doppler is a primary surveillance tool in an SGA fetus and helps detect abnormal perfusion of placental villi. In high-risk population, its use decreases perinatal morbidity and mortality. Mortality is decreased by about 29% when UA is used as a surveillance tool. The blood flow in the umbilical artery during diastole is the parameter of interest in UA. The forward flow is constant in a normal fetus during diastole [Figure 1]a, but in a growth-restricted fetus, there is increased resistance to flow in the umbilical artery leading to a decrease in flow during diastole [Figure 1]b, which corresponds to decreased perfusion of the placental villi. In severe cases, there is absent and even a reverse flow (blood flow back to the maternal circulation). Figure 1:(a) Normal umbilical artery Doppler. (b) Umbilical artery Doppler waveforms in intrauterine growth restriction showing restricted flow during diastole. The MCA Doppler looks at blood flow in the MCA of the fetal brain. In a normal fetus, there is high resistance flow in the MCA (in contrast to UA Doppler). IUGR is most commonly caused by placental insufficiency, in response to which the fetus adapts its circulation to preserve oxygen and nutrient supply to the brain (“brain-sparing”). When there is brain-sparing, there is compensatory vasodilation which leads to low resistance and hence increased flow through the vessel [Figure 2]. This leads to a decreased MCA-PI. MCA-PI less than the 5th centile is a surrogate marker of fetal hypoxia. Abnormal MCA Doppler is associated with adverse perinatal and neurological outcomes. At term, MCA-PI <1.2 is considered abnormal. Figure 2: Middle cerebral artery Doppler showing normal and abnormal (high diastolic velocity) waveforms. DV Doppler in the surveillance of preterm SGA fetus has moderate predictive value for acidemia and adverse perinatal outcome. Abnormal DV Doppler is used to determine the time of delivery, especially in preterm IUGRs with abnormal UA Doppler. The other modalities of surveillance include nonstress test (NST), biophysical profile, and modified biophysical profile (NST and AFI). A reactive NST, with good variability of the heart rate above the baseline [Figure 3], is indicative of a normal fetus. A nonreactive NST correlates well with fetal hypoxemia or academia. It is to be used only in conjunction with other tests. Figure 3: Reactive nonstress test. The biophysical profile includes five components which are used to evaluate the health of the fetus. These components are reliable and reproducible tools with a good correlation with fetal hypoxia if there are abnormal scores. Each component is given score of 2 (normal) or 0 (abnormal), and the biophysical profile score (BPS) is calculated by adding the scores [Table 1]. It must be noted that if there is oligohydramnios, further evaluation is warranted regardless of the score. A complete BPS is time consuming and takes about 30 min for each individual, which may not be practical in many situations. The modified BPS  which includes only two components – NST and AFI – may be used as an alternative. Abnormal AFI is indicative of chronic hypoxia, and nonreactive NST is indicative of acute hypoxia. The involvement of the mother is integral to the surveillance of a fetus with growth restriction. Fetal movement is an indicator of the integrity of the central nervous system, and musculoskeletal system of the fetus and the mother must be taught to monitor the activity of the fetus and to report back if there are any abnormalities. The mother is advised to monitor the fetal movement using the Cardiff count or the daily fetal movement count (DFMC) chart. The Cardiff count requires pregnant women to begin a fetal movement count at a selected time each day, count ten movements, and record the elapsed time from the first to the tenth movement. Findings which would indicate possible danger to the fetus and which should be reported immediately include less than ten movements in 12 h; no perception of movement in an 8-h period; a change in the usual pattern of fetal movement; or a sudden increase in violent fetal movements followed by complete cessation of movement. The daily fetal movement count (DFMC) is a tool that is inexpensive, uncomplicated, and noninvasive. It is a clinically effective mean of screening for fetal well-being after 20 weeks' gestation. The mother is advised to do a DFMC. For this, she is asked to lie in left lateral position and focus on fetal movements for a 2-h period during the day. If there are ten or more discrete movements in that 2-h period or four movements in 1 h, it is considered normal. The DFMC chart may also be used to record the number of fetal movements perceived by the mother for 1 h at a particular time of the day (e.g., after each meal-breakfast, lunch, and dinner) and record it. Serial recordings may be charted according to the gestational age. Fetal movements are considered satisfactory if the count is >3 on each occasion. This has been shown to be a useful tool in identifying patients at risk for hypoxia. Antenatal surveillance by the physician includes clinical examination and the Doppler studies discussed above. These will aid in monitoring the growth of the fetus and in deciding the time and mode of delivery. The frequency of antenatal surveillance depends on the severity of the fetal growth restriction (FGR), findings of the Doppler studies, and the AFI. 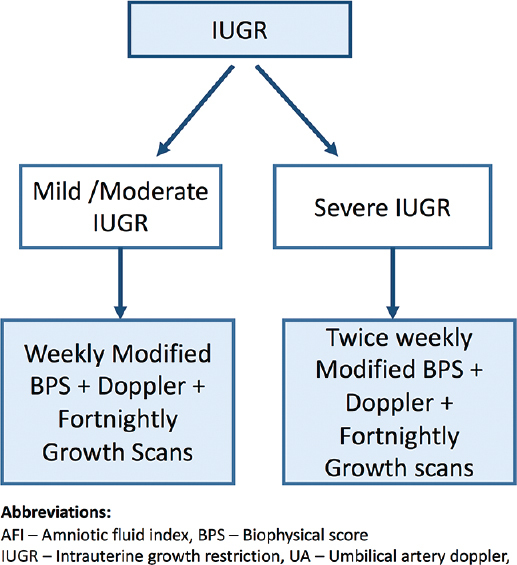 If there is mild/moderate IUGR, the recommendation is weekly modified BPS with Doppler studies and growth scans once in 2 weeks [Figure 4]. In severe IUGR, frequency of surveillance increases to twice weekly BPS and Doppler studies with fortnightly growth scans. The frequency of growth scans is not increased, because this tends to increase the rate of errors, thus decreasing the sensitivity and accuracy. Figure 4: Frequency of surveillance. 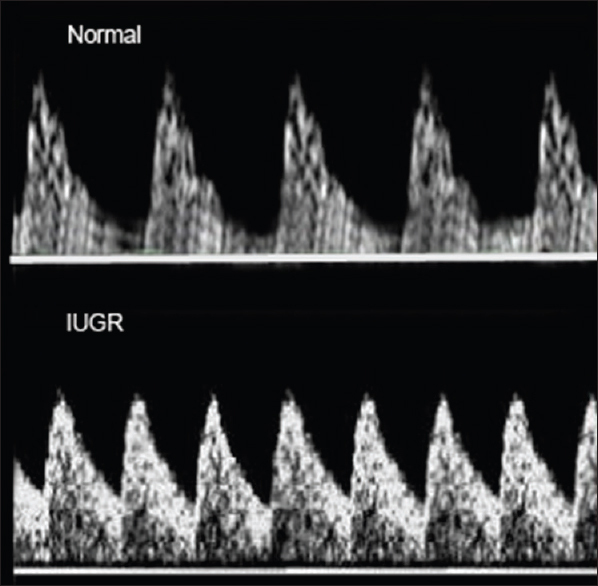 For the management of IUGR, the individuals may be categorized into (1) those with abnormal umbilical artery Doppler and normal AFI and (2) those with normal Doppler study and abnormal AFI. If the UA Doppler is abnormal and the AFI is normal, the management depends on the gestational age. 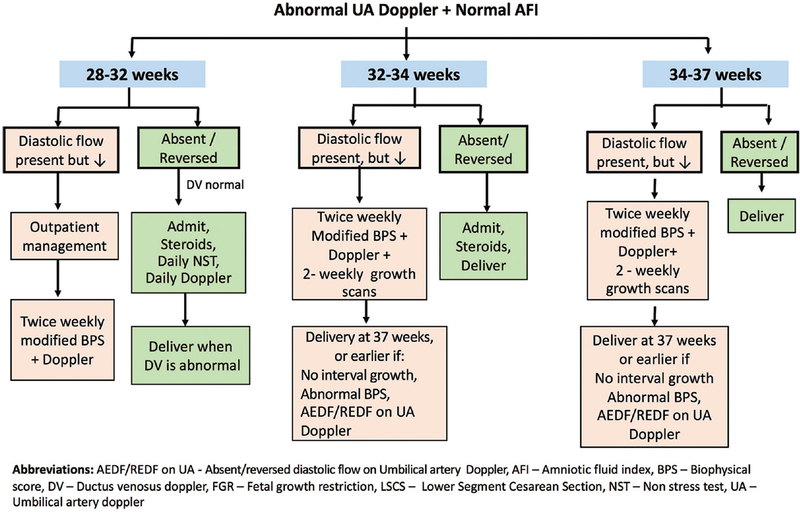 The three groups are 28–32 weeks, 32–34 weeks, and 34–37 weeks of gestation, and in each of these groups, the management depends on whether the UA Doppler indicates decreased flow or absent/reversed flow [Figure 5]. Figure 5: Management of intrauterine growth restriction with abnormal umbilical artery Doppler and normal amniotic fluid index. If there is absent or reversed diastolic flow on UA Doppler, we would recommend doing a DV Doppler. If the DV Doppler is normal, the mother must be admitted and initiated on corticosteroids and monitor with daily NST and Doppler studies. The baby is delivered when there is an abnormal DV Doppler study. If the diastolic flow on UA Doppler is present but decreased, the mother may be managed on an outpatient basis, with twice weekly BPS and Doppler studies. If there is absent or reversed diastolic flow on UA Doppler, we would recommend admitting the mother and initiating corticosteroids. Further expectant management is not recommended and the baby is delivered following administration of steroids. If the diastolic flow on UA Doppler is present but decreased, the mother may be managed on an outpatient basis, with twice weekly modified BPS and Doppler studies along with fortnightly growth scans. Delivery of the baby is planned at 37 weeks or earlier (1) if there is no growth in the interval period, (2) if there is an abnormal BPS, or (3) if there is absent or reversed diastolic flow in UA Doppler at any point. At this gestational age, if there is absent or reversed diastolic flow on UA Doppler, we would recommend admitting the mother for delivery of the baby immediately. If the diastolic flow on UA Doppler is present but decreased, the management is the same as in the 32–34-week gestational age group. When the AFI is low, the treating obstetrician must rule out an amniotic fluid leak. If there is no leak and if the gestational age is >34 weeks, the baby must be delivered as soon as possible. If the gestational age is <34 weeks, the mother must be admitted and initiated on corticosteroids and monitored. If the AFI is persistently low, the baby must be delivered as soon as possible [Figure 6]. 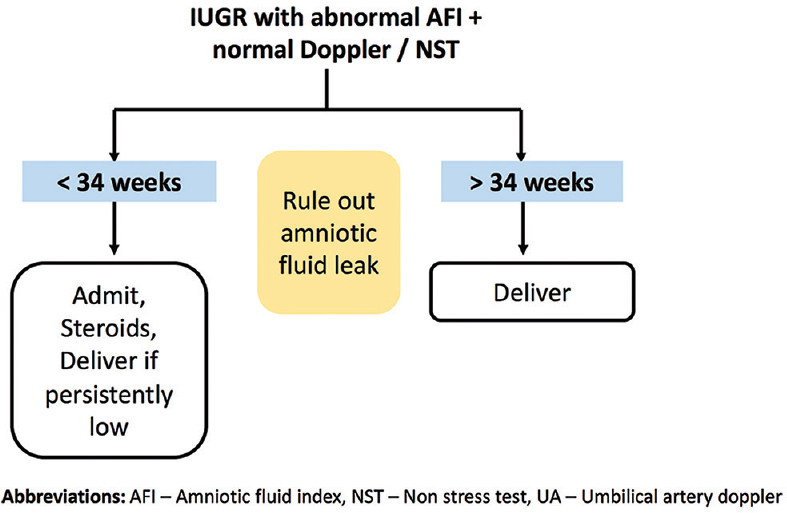 Figure 6: Management of intrauterine growth restriction with abnormal amniotic fluid index + normal Doppler nonstress test. If there is abnormal DV Doppler or if the UA Doppler shows absent/reversed diastolic flow, lower segment cesarean section (LSCS) is recommended as the mode of delivery. This is because with a background of absent or reversed flow the fetus will not be able to tolerate labor pains. 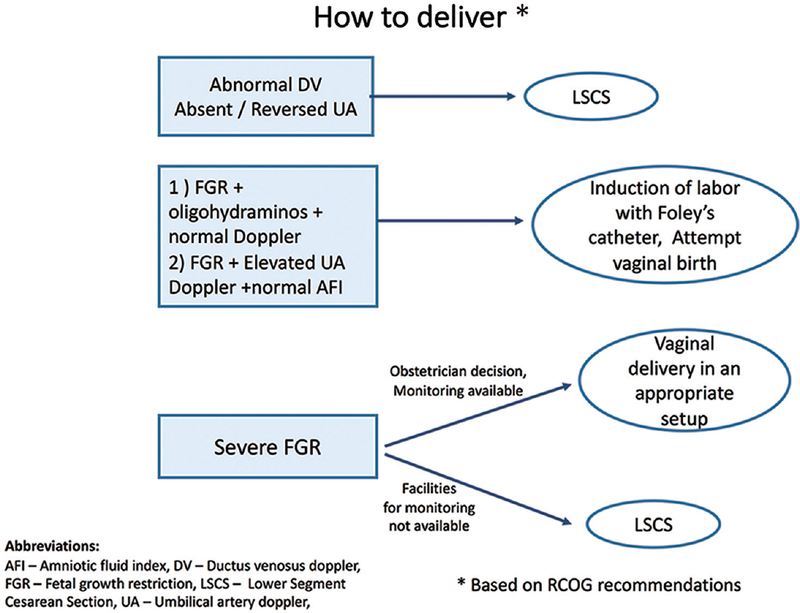 If there is FGR with either oligohydramnios and normal Doppler studies or with normal UA Doppler and normal AFI, then vaginal delivery may be attempted after induction of labor (IOL). In case of severe FGR, the mode of delivery is dependent on the obstetrician's level of expertise and facilities for monitoring. Vaginal delivery may be attempted in an appropriate setting with adequate monitoring facilities [Figure 7]. Figure 7: Mode of delivery. It is important that a fetus with IUGR be delivered in a facility with appropriate backup, both obstetric and neonatal. There must be facility for one-on-one monitoring or continuous cardiotocography. There must be facility for doing cesarean section at any time. There must be an anesthetist available as well as the necessary theater setup. It is also very important that facilities are available for appropriate neonatal care as these babies maybe hypoxic, hypothermic or may go through various metabolic changes. If the fetus has severe growth restriction. If there are associated abnormal AFI and Dopplers. Early-onset FGR – this also needs further evaluation in a higher center. FGR with associated medical disorders such as diabetes or hypertension - may also have better outcomes if managed in a higher level center. Early FGR is not common, and by definition, it is diagnosed at or <32 weeks of gestation. It differs from late-onset FGR in terms of its clinical manifestations, association with hypertension, patterns of deterioration, and severity of placental dysfunction. Common causes for early-onset IUGR include uteroplacental insufficiency, chromosomal abnormalities, and infections. If there is very early onset of growth restriction, there are certain investigative procedures that need to be done. Uterine artery Dopplers help in determining whether the pathology behind the growth restriction is related to uteroplacental insufficiency or not. Fetal anatomy screening and karyotyping will help in detecting chromosomal abnormalities, if any. If the morphology of the fetus appears to be normal, a karyotyping can be done. Fetal infections such as cytomegalovirus, toxoplasmosis, syphilis, and malaria need to be ruled out with appropriate investigations. Unfortunately, early-onset IUGR is usually associated with a very poor prognosis. The amniotic fluid volume and Dopplers are normal. A pregnancy with an SGA fetus should manage with close monitoring which includes fortnightly growth scans and Doppler studies. Delivery may be planned at 38–39 weeks. MCA Doppler abnormality is a surrogate marker of fetal hypoxia and is particularly valuable for the identification of and prediction of adverse outcomes in late-onset FGR, independent of the UA Doppler, which is often normal in these fetuses. MCA may be abnormal in 20% of those with normal UA Doppler. It helps in identifying these cases and decreases the chances of a stillbirth. Cerebroplacental ratio (CPR), which is the ratio of MCA-PI/UA-PI, is useful marker for cerebral hypoxia. A value <1 at term is abnormal. It is associated with an 11-fold increase in adverse perinatal outcomes, and 25% of term FGR can have abnormal CPR. The RCOG recommends administration of steroids in growth-restricted fetuses between the gestational age of 24 and 35 + 6 weeks if considering early delivery. 38–39 weeks for SGA babies. Close monitoring during labor with easy access to operating theater facilities and very good neonatal intensive care unit backup will help in decreasing the rate of complications due to IUGR. Figueras F, Gratacos E. An integrated approach to fetal growth restriction. Best Pract Res Clin Obstet Gynaecol 2017;38:48-58. Hughes DS, Magann EF. Antenatal fetal surveillance “Assessment of the AFV”. Best Pract Res Clin Obstet Gynaecol 2017;38:12-23. Royal College of Obstetricians and Gynecologists. The Investigation and Management of the Small – For – Gestational – Age Fetus. Green – Top Guideline No 31. Minor Revisions. 2nd ed. February, January, 2013, 2014. Available from: https://www.rcog.org.uk/globalassets/documents/guidelines/gtg_31.pdf. [Last accessed on 2017 Sep 07]. Aditya I, Tat V, Sawana A, Mohamed A, Tuffner R, Mondal T, et al. Use of Doppler velocimetry in diagnosis and prognosis of intrauterine growth restriction (IUGR): A Review. J Neonatal Perinatal Med 2016;9:117-26. Seravalli V, Baschat AA. A uniform management approach to optimize outcome in fetal growth restriction. Obstet Gynecol Clin North Am 2015;42:275-88. Preboth M. ACOG guidelines on antepartum fetal surveillance. American college of obstetricians and gynecologists. Am Fam Physician 2000;62:1184, 1187-8. Lehman AE, Estok PJ. Screening tool for daily fetal movement. Nurse Pract 1987;12:40-2, 44. Singh G, Sidhu K. Daily fetal movement count chart: Reducing perinatal mortality in low risk pregnancy. Med J Armed Forces India 2008;64:212-3. Frøen JF, Heazell AE, Tveit JV, Saastad E, Fretts RC, Flenady V. Fetal movement assessment. Semin Perinatol 2008;32:243-6. Khalil A, Thilaganathan B. Role of uteroplacental and fetal Doppler in identifying fetal growth restriction at term. Best Pract Res Clin Obstet Gynaecol 2017;38:38-47.